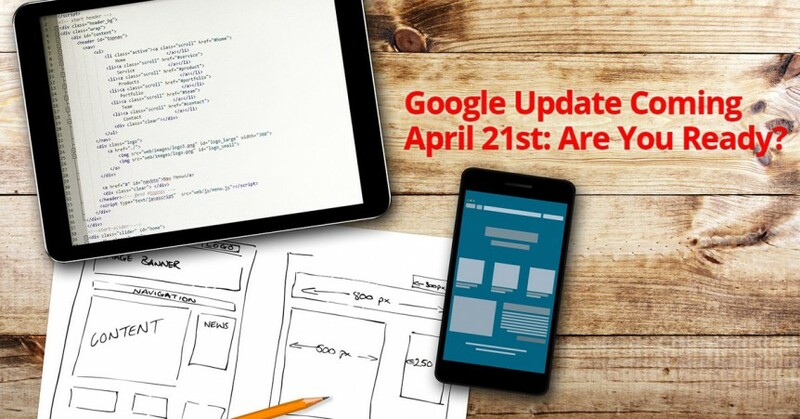 By now you’ve probably heard about the update to Google’s algorithm update that’s coming on April 21st. Based upon how much Google has said about it publicly, it’s widely believed to be the biggest single algorithm change in Google’s history. There’s a fair amount of confusion about it, so let’s do what we can here to clarify what’s going on and how it affects you. What’s Changing in this Google Algorithm Update? First of all, this change will affect Google search results. That means that if you have a website, you will most likely be impacted in some way — either because your site itself is rewarded (or punished), or because the other sites that “compete” with you for search rankings on a given search result will be rewarded or punished. Specifically, Google will be changing how sites are ranked based upon how “mobile friendly” they are, as measured by Google. This is a direct response to the explosion in mobile traffic that has occurred in recent years, and nobody understands this better than Google, whose revenues from mobile users have been rapidly expanding while desktop revenues have declined. It’s also not the first time Google’s algorithm has been adjusted to reward sites that create a better user experience for mobile visitors than others. But this is anticipated to be the most dramatic change ever. Thankfully, you don’t have to wonder about it. 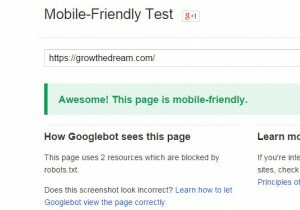 In fact, you may have already seen some evidence about what Google thinks about your site’s mobile-friendliness. In recent months, 2 indicators from Google have surfaced. One is the “mobile friendly” label accompanying certain search results, which is intended to signal visitors that they’ll likely have a good experience when visiting those websites from a mobile device. 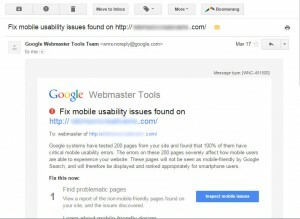 The second indicator will have arrived in your email inbox if your site had mobile usability issues AND if you had registered for Google Webmaster Tools. If you saw one of those emails, it might have seemed like a nice gentle note from Google that wasn’t all that urgent. In fact, it’s something you should not ignore. As an aside, generally any email from Google Webmaster Tools should scream for your attention, since they often leave important messages for you in your Webmaster Tools account which they never bother to email you about! If you haven’t noticed any labels next to your site’s listing in search results and you haven’t gotten any emails, don’t worry… there’s a test. When you visit Google’s Mobile-Friendly Test, simply plug in a URL and their test tool will report back to you what it finds. What you’re hoping to see is an “Awesome! This page is mobile-friendly. ” in nice big green print. If that isn’t what you see, then read on. We’ve got some tips for you. Keep in mind: the test results are only for the specific URL you submitted. In other words: you could have some pages that “pass” the mobile-friendly test while others fail. Theoretically, you would have to submit every URL for your entire site to be sure, but thankfully most of us won’t need to do that. What If Your Site Isn’t Mobile-Friendly? If you don’t see the “Awesome!” on your test result, then there isn’t much time left to address the problems before you could see your search traffic from Google begin to decline. While no one knows with 100% certainty exactly what’s going to happen on April 21st, there are a few things we do know. In its blog post from February 26th, Google announced what is arguably more than it has ever announced prior to any algorithm change we’ve seen. Sites that are not “mobile-friendly” (according to Google) will likely move down in search rankings. Sites that are “mobile-friendly” will most likely get a boost in search rankings. First of all, when you see Google announcing something that, “…will have a significant impact in our search results,” this is a huge statement. Google usually does not use language this clear and this bold regarding search results. This is why I must urge you to pay attention. Secondly, as many as 40% of the top 25,000 websites may not be ready to meet Google’s mobile-friendly standard. My guess is that sites that don’t even make it into the top 25,000 may be even more likely to not be ready. This means that it’s your opportunity to get ahead of some of your “competitors” — at least those sites with whom you compete for search rankings (and therefore traffic) on given terms. What Can You Do to Make Your Site More Mobile-Friendly? We’ve been advising clients for the last several years now that sites should follow responsive design principles. By far, the easiest way to move to a responsive design is to use a content management system like WordPress. This has been one of our most oft-repeated recommendations since we first discovered WordPress in 2006. So… the first step is to get your site moved over to WordPress. Changing your WordPress theme is relatively inexpensive (compared to building a site from scratch), and —depending upon your level of skill and courage — may even be something you undertake yourself. If you do need help, WordPress developers are very common. You can also reach out to us and my team may be able to give you a hand with this transition. But don’t wait. Many of the best developers are already too busy to take on new site conversions before the deadline. Feel free to drop a question in the comments below. I’ll do my best to tackle them for you here. You can also check out the latest episode of The Growth Show for more discussion about this with my good friends Rod Thomson and Josh Muccio. Is it affecting desktop keywords rank ? Generally speaking, it shouldn’t be. However, it’s entirely possible that the larger reputation of a site is being affected by the mobile friendliness score, which could of course cause rankings to drop. To answer about a specific case, it would be hard to speculate without some details. It would be a really good idea to log into Google’s Search Console (formerly known as Webmaster Tools) and dig around to see what’s happening. There are lots of metrics available to you in there that will give you a more complete picture of what’s going on.